With its history rooted in American tradition, quilting has long been an activity meant to bring women together to converse and create. 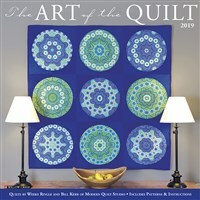 Celebrate the art of quilting as a time-honored craft and modern expression of individuality in this calendar, complete with 13 unique designs, patterns, and instructions by Weeks Ringle and Bill Kerr of Modern Quilt Studio. This large format wall calendar features grids with ample room for jotting notes. Also included are moon phases (CST), along with U.S. and international holidays. Weeks Ringle co-founded Modern Quilt Studio with her husband, Bill Kerr, in 1999. Bill and Weeks have coauthored numerous books on modern quilting, color for quiltmakers, and transparency quilts. They also coauthored a sewing book for children with their daughter, Sophie.